The tiny island of Bali in Indonesia carries over a thousand years of rich musical tradition, originally founded in the collision of Javanese, Hindu, and indigenous cultures, the music of Bali is among the most unique in the world. The traditional music, based on a five-tone scale, is played by the "Gamelan Orchestra,” a large ensemble consisting of tuned bronze gongs (two or four sets, tuned high and low), metallophones (usually four or more of these), wooden end-blown flutes, bowed stringed instruments, hand drums, and other percussion. The music is written in such a way to require two pairs of metallophones and gongs interlocking in cycles (in live performances normally played on opposite sides of the stage), the primaries and secondaries frequently play in unison, and are slightly detuned from each other, the difference in tone creating a carefully calculated harmonic 'beating' effect. Live performances are combined with traditional costumed Balinese dance; the overall effect is nothing short of stunning. For this album, three American composers — Michael Tenzer, Wayne Vitale, and Evan Ziporyn — each of whom have studied classical gamelan with the Sekar Jaya group in northern California under the direction of Nyoman Windha, purported to be the finest gamelan orchestra outside of Indonesia — have created hybrid compositions using the traditional instruments of the gamelan with western instruments such as saxes, clarinet, guitar, cello, even vocals on one of the tracks. 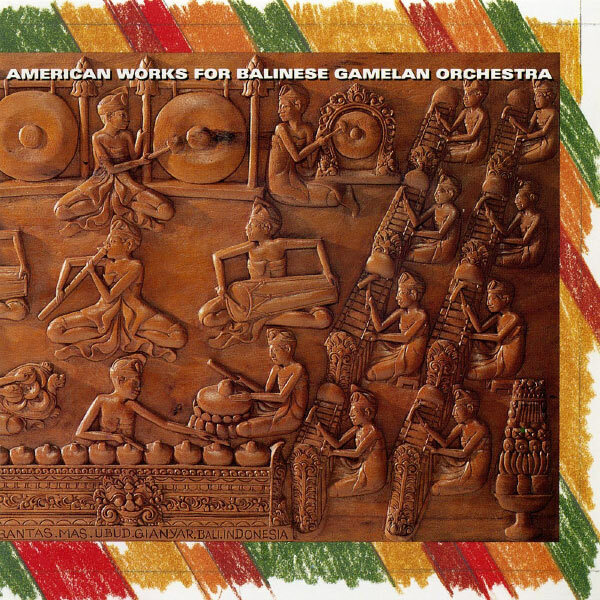 The degree of western influence varies from one track to the next — each of the five are unique unto themselves — but in all cases the gamelan orchestra is the basis of the compositions, not just used as an ornament for western styled music; this is very true to the traditional spirit. I suppose any further attempts at describing this extremely complex music here would be futile and pointless; it must be experienced to be understood. Highly recommended for open minded and adventurous listeners.